The CEOS Earth Observation Handbook presents the main capabilities of satellite Earth observations, their applications and a systematic overview of present and planned CEOS agency Earth observation satellite missions and their instruments. 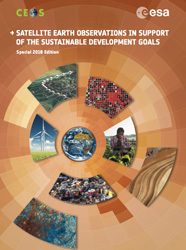 This report has been compiled to help develop a broader understanding of the fundamental, strategic importance of satellite Earth observation data to the 2030 Agenda for Sustainable Development and the Sustainable Development Goals (SDGs). Satellites have a role to play in relation to most of the agreed Goals and have been shown to have the potential to support national reporting against a quarter of the associated Targets, and to inform national development policies.